So I just watched Step Up 2 The Streets, the ultimate Halloween movie. And I was thinking, you could totally do this in Mist-Robed Gate. Whenever someone doesn’t want to make a choice, you have a dance fight. Now, most roleplayers probably aren’t used to describing dancing as well as they’re used to describing crazy attacks and defenses, but, with a little practice, I bet folks could turn out some wicked dance descriptions. I just wanted to “hell yes” this as a social socket person (with a minor in aesthetics). I’ve often said that, to me, a roleplaying game is chiefly a way of structuring social interaction to create more interesting results (for whatever definition of “interesting” you like, mine generally leans towards “aesthetically interesting”). As such, while hanging out is socially rewarding, playing games is socially rewarding in a variety of manners (depending on the game and playgroup) that are much harder to achieve in the social activities that are generally performed in contemporary middle class American society. It generates the same intoxicating social vibe, in my experience, as cooperating on some onerous project together: climbing a mountain as a group, putting on your own play. That feeling of collective accomplishment and what it does for interpersonal relationships is unmatched, I think. Roleplaying (again, for me) is anthropology in reverse, a pro-active attempt to create ritual communities. The closest I corollary I can think of is designing worship services or planning the activities of a cult (in that sense, Dark Dungeons was spot-on). In what other hobby can you get a group of people to do almost anything by designing a rewarding social and creative experience around it? Only the kinds of postmodern art circles that I wouldn’t want to be a part of, probably. So, for people interested in human behavior and societies — how they work and how they could conceivably be designed to work — roleplaying offers an environment for enjoyment, learning, experimentation, and camaraderie that is unmatched. Hanging out is great, but it can’t do that. This is the first part of a script for a comic I’ve been thinking about doing for a while. It’s about what it’s like to be a supernatural creature in contemporary China, using that to examine all the day-to-day compromises people make in a place where the sheer number of people and scale of problems leads to different kinds of choices than we usually encounter in America. The name of the lead character will change, because it’s currently stupid. Godzilla is destroying Beijing. Yu’s running away but bumps into an old man. Yu wakes up in his bed, all twisted in the sheets. The alarm is going off for his flight. A few panels of filling out the form. A few panels of him trying to think about what to mark. Hands forms and passport to female desk clerk. She runs them through the computer system. The PAP lead him to the Special Customs Security Office, down a long corridor away from the other parts of customs and immigration. There are paramilitary personnel standing outside and inside the door, the ones outside maybe even carrying assault rifles on a strap. It’s otherwise empty, but there’s a young women, about his age, sitting several chairs down from him. Shot of him waiting, with clock. More waiting; clock shows 20 minutes have passed. He gets up and walks down to talk to the girl; clock shows 20 more minutes have passed. Shot of her face, which is a horrible demon visage full of teeth and eyes. I’ve been playing Bliss Stage with some local folks (Dev, Robert, and Eben). It’s been terrific and I just posted a full write-up of the first two sessions on Story Games. I’m going to keep updating there, assuming I have time (AP reports take forever! ), because this blog is already turning out words at an insane rate these days. Enjoy! Travis Stever, the guitarist of Coheed & Cambria, has an album out with his new band Davenport Cabinet and, while the vocals aren’t very exciting (that’s why he’s the guitarist), there’s a lot of banjo all over the place, which surprised me. I’m dropping in my “emo folk” folder, to join — the only other entry — Bright Eyes’ Lifted Or the Story is in the Soil, Keep Your Ear to the Ground. Not bad company, really. If you just wanna pick up one Davenport Cabinet track, I suggest the first track, “Square One,” which is an instrumental that opens with that unmistakable twang. Yeah, I wouldn’t have imagined it either, until I heard The Black Keys’ track “Psychotic Girl” while watching (coincidentally enough) Gossip Girl. So I looked it up and, yeah, produced by Danger Mouse. That’s a good way to earn my 99 cents, right there. Cross-posted from Story Games, where lately I’ve been trying to “post less, but post better,” which this is a good example of. Outside playtesting is a tough egg to crack, in all honesty. You can have a really great game (Thou Art But a Warrior, How We Came to Live Here) and still have almost nobody playtest it, aside from groups your organize yourself. However, once you get a few people playtesting and posting about your game, you can usually get a few more, and then a few more. It’ll sometimes peter out, though. For example, when the GoPlayNW folks started playing Geiger Counter, there were a few weeks where I got 60% of all the outside play AP the game has ever had. Since then, I’ve gotten a few one-line notes that people have played and enjoyed it (which is awesome, don’t get me wrong), but only a few isolated AP posts. Those are still super useful and I’ll read over them like a hawk when I get around to writing the final version of the game, but it just goes to show that playtesting is a seesaw. From my perspective, anything a creator can do to make it more likely that people will playtest their game is a good choice. And this means releasing it in as many different formats as they have the time and energy to do. PDFs are great, but if they don’t get people to sit down and actually play your game, you may have to try something else. 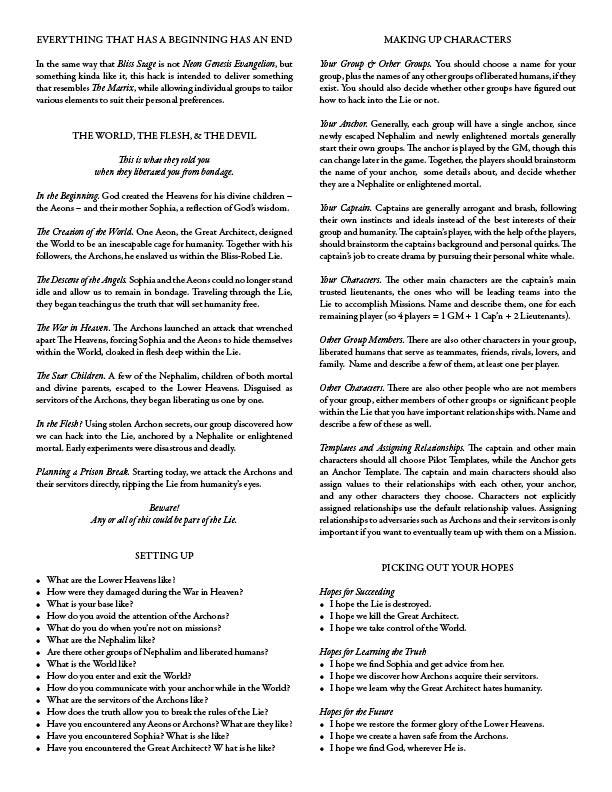 Sometimes selling or giving away free print copies, even ones made on a photocopier like the Geiger Betas I gave away at GenCon, might help you with that… but, then again, they might not. I’m not sure if I’ve received ANY posts from people who picked up one of those hardcopies. That doesn’t mean they were a bad idea, necessarily, but that I’m not sure they worked in this particular case, at that particular venue, without me running the game and helping get folks excited about it (since I had to bail on actually going to GenCon at the last minute). Another issue is that… who is your playtesting audience really? People have to be fairly committed to helping you with your game in order to playtest something, which usually means they have to be so excited about playing your game that they want to play it even when it isn’t complete. Honestly, folks who are really into indie games — especially other indie game creator-publishers, the folks whose attention you might think you need to get for your game to be vetted / successful / etc. — are probably less likely to do independent playtesting for you. They already have a bunch of games they’ve been wanting to play for a while, in addition to their own game projects that they need to playtest. If you can sit down with them at a housecon (frex. JiffyCon) or a larger convention (Dreamation, GenCon), you’ll probably find they’re more than happy to play your game and offer feedback, but getting folks to independently commit their own time is harder. All that of which is to say: finding independent playtesters is hard. You want really smart, thoughtful people who aren’t already strongly committed to other projects and games, so they can take the time and attention to get excited about yours and actually play it, ideally more than once. Honestly, you may be more likely to find those 1) locally, among people you’ve talked to in person about your game, 2) on a general site like RPGnet, or 3) from among the lurkers on SG more than from among the people who post a lot or have published one or more games. How do you find those people? Really, it’s anybody’s guess. 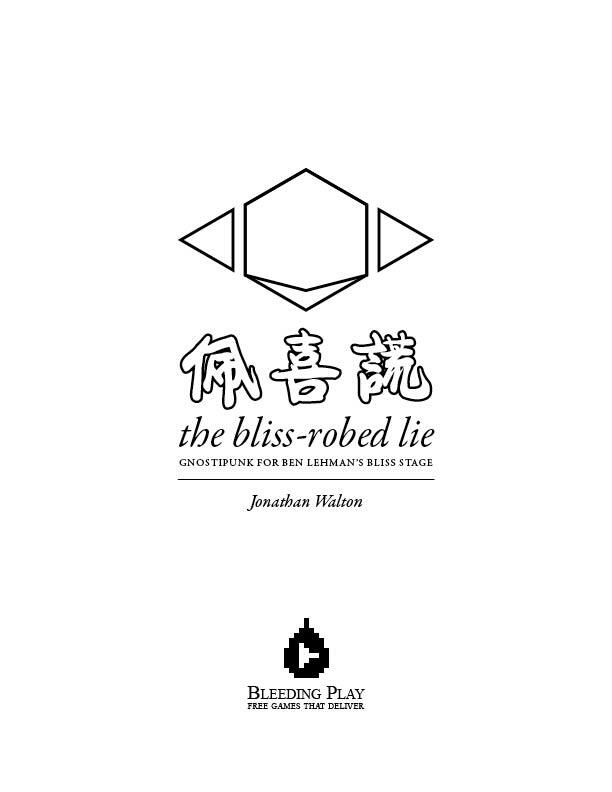 Right now, it’s looking like The Bliss-Robed Lie will be a free supplement for Bliss Stage, posted in alpha form here soon and eventually, once it’s been playtested, published free through Bleeding Play. After that, I’ll probably end up polishing up Agonia to be published the same fashion. This is the third part of my Matrix-y hack of Bliss Stage. Trauma, Terror, & Gnosis. Trauma still represents a team leader’s mental anguish, killing them if it ever reaches seven (7). Terror represents how badly the mission is going and, additionally, how many servitors of the Archons have become aware of the characters. Gnosis replaces Bliss as the trait that removes characters from the group (they become the anchor of another group) or allows them to replace the group’s anchor (and have their player become the GM) once it hits 108 and a character becoming enlightened. Truth, Trust, & Stress. The potency of a relationship lies in its authenticity, its ability to overcome the Lie. Truth, then, replaces Intimacy, while still using the Intimacy Levels Chart as a rough guideline for what Truth values represent. Trust and Stress remain. Harm & Death. Team members involved in missions can suffer Harm if one or more objectives are not achieved, though Harm is not usually allotted for missions that are abandoned with even being attempted. Additionally, characters can gain Harm from broken relationships. Any character that gains three (3) Harm is killed and all team leaders gain 3xTruth in Gnosis, becoming more aware of death. The Plan. The Archons and their servitors are planning a new assault on the Lower Heavens, attempting to destroy your group and any other rebels they can find. In order to throw a wrench in their plan, you need to take out several targets, which can be key servitors, bases, artifacts, machines, or a mixture of the above. Each team will be responsible for taking out a single target, though it’s possible that teams from other groups are participating as well. The captain will clearly be leading one team, perhaps at the most important target, but each of his lieutenants will also be leading a team. Initial Objectives. 1) Destroy the target; 2) Get out alive. If the first objective is unsuccessful, the team leader chooses one team member to gain Harm. If the second objective is unsuccessful, you’ll have more than Harm to worry about. The second part of my Matrix-inspired hack of Bliss Stage. Your Group & Other Groups. You should choose a name for your group, plus the names of any other groups of liberated humans, if they exist. You should also decide whether other groups have figured out how to hack into the Lie or not. Your Anchor. Generally, each group will have a single anchor, since newly escaped Nephalim and newly enlightened mortals generally start their own groups. The anchor is played by the GM, though this can change later in the game. Together, the players should brainstorm the name of your anchor, some details about, and decide whether they are a Nephalite or enlightened mortal. Your Captain. Captains are generally arrogant and brash, following their own instincts and ideals instead of the best interests of their group and humanity. The captain’s player, with the help of the players, should brainstorm the captains background and personal quirks. It is the captain’s job to create additional drama among the other characters by pursuing their personal white whale. Your Characters. The other main characters are the captain’s main trusted lieutenants, the ones who will be leading teams into the Lie to accomplish Missions. Name and describe them, one for each remaining player (so 4 players = 1 GM + 1 Cap’n + 2 Lieutenants). Other Group Members. There are also other characters in your group, liberated humans that serve as teammates, friends, rivals, lovers, and family. Name and describe a few of them. Other Characters. There are also other people who are not members of your group, either members of other groups or significant people within the Lie that you have important relationships with. Name and describe a few of these as well. Templates and Assigning Relationships. The captain and other main characters should all choose Pilot Templates, while the Anchor gets an Anchor Template. The captain and main characters should also assign values to their relationships with each other, your anchor, and any other characters they choose. Characters not explicitly assigned relationships use the default relationship values. Assigning relationships to adversaries such as Archons and their servitors is only important if you want to eventually team up with them on a Mission.